As can hopefully be seen in the thrilling animation above, the master starts off sending a the byte 0x9F to the slave. At the same time, the slave is also sending data to the master. Until the slave has received the whole 8 bits, it does not know what the master is sending to it. So it has to wait until it receives the 8 bits, formulate a response and then send it out to the master the next time. Assuming it generates the response instantly, it still has no way to send the data back to the master because only the master can generate clock signals. This is why the master is seen to again be sending 0xFF (a dummy value) to the slave, purely to provide it with the clock signals it needs to send the data back to the master. 0xFF is typically used to avoid confusion with actual commands. So as you can see, it's fairly involved and there's a lot of hand-holding required. The speed is also not fantastic. We have a maximum speed of 50MHz, though some peripherals only work up to 20Mhz or even less. We can also send only one bit at a time, so even at 50MHz, we're only getting a maximum transfer rate of 6.25MB/s. This is where Serial Quad Interface (SQI) comes in. "Up to"? 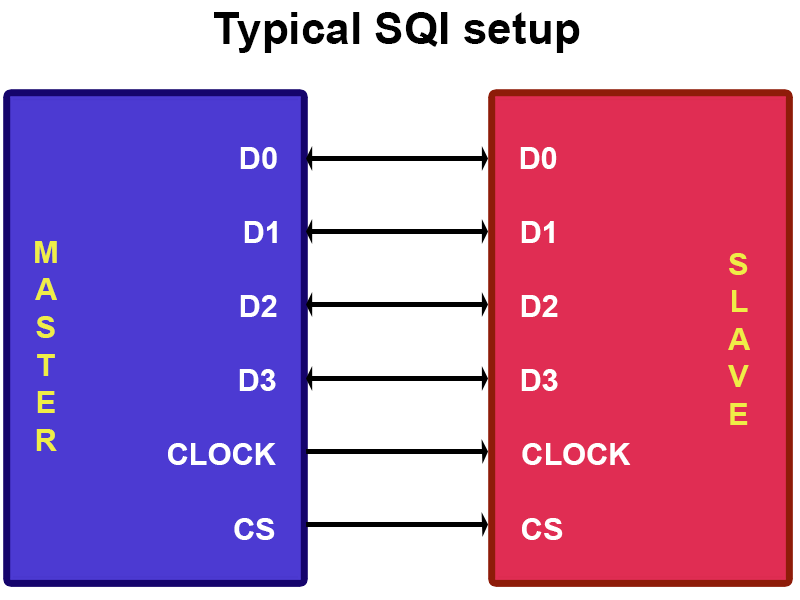 Yes, SQI can be configured to send either 1 bit, 2 bits or 4 bits at a time. 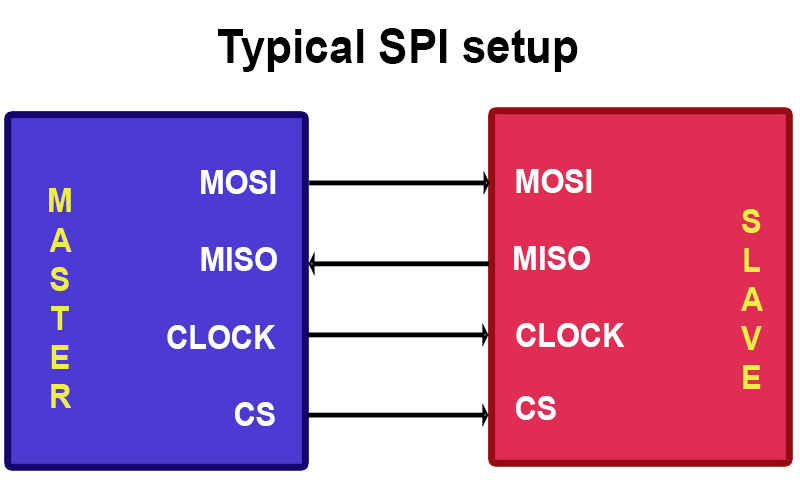 Many external devices that support both SPI and SQI start up in SPI mode and need to be sent a special command in order to switch to SQI mode. The PIC32MZ SQI peripheral fully supports this, thankfully, so if you really wanted you could use the SQI peripheral as a regular SPI peripheral. From this, we can see the major difference between SPI and SQI. With SPI, we had one line for sending data to the slave and one line for receiving data and they were both in use at the same time. That is to say that communication was full duplex. With SQI, communication can only occur in one direction at a time, it is half duplex. OK, not that hard so far. The hard part comes next. One of the most important things to remember with SQI on the PIC32MZ is that the communication can only happen in one direction at a time. This means we need some way of telling the PIC32MZ whether we want to send or receive data. This also means that, unlike the SPI peripheral, we cannot just write data to the SQI buffer and hope it'll get sent because it won't. OK, that's a lot of registers, but why? Well, with SQI Microchip decided you know what, why don't we make this as fancy as we can? And to their credit, it is very fancy, but it can be very confusing too. Whereas with SPI we had to handle the transactions one by one, that is no longer the case with the SQI peripheral. Everything now works with buffers, meaning I can load up a whole list of transactions and it'll do them one by one. I repeat, writing to any of these registers will add whatever you've written to a buffer (or a queue). This means that for every transaction with SQI, I need to tell it how many bytes I want to send or receive, how many lanes (1, 2 or 4) I will use and whether or not it's a send or receive transaction and then write the data to SQI1TXDATA (or read it from SQI1RXDATA). It can be confusing, so I'll go into it more in a moment. 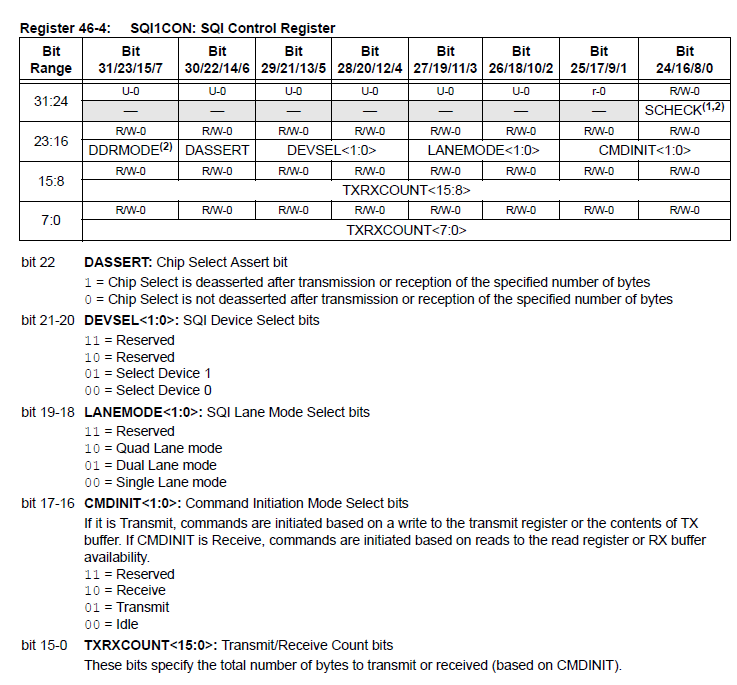 If you've been following along with the PIC32MZ datasheet, you may have experienced cases where the datasheet contradicts itself multiple times. The SQI is one such case and why it's taken so long for me to get this code working at an acceptable level! As such, some of these registers remain a bit of a mystery to me but I know they have to be set in order for stuff to work :) Let's take a look at them one by one, very briefly. I think this controls how many transactions we can queue up in the SQI Control buffer. I just set it to 0x100 when I initialise the SQI peripheral and never touch it again. I think this is used to set how many bytes transferred or received will trigger a transfer or receive interrupt. Again, I just set it to 0x100 when I initialise the SQI peripheral and never touch it again. I think this is used to set how many bytes need to be in the send or receive buffer before the SQI periperhal will start doing anything. I again set this before each transaction and I set it to be the same as the number of bytes I'm about to transmit/receive. The lower 6 bits are receive bytes and bits 8 to 13 are for transmit bytes. Note: There are two Chip Select pins (SQICS0 and SQICS1) so I presume that's where device 0 and 1 come from. I don't use either, I use a different pin as chip select and have only been able to get it to work using device 1. No, I don't know why. Note 2: TXRXCOUNT is an ambitious 16 bits wide but the actual buffer itself is much smaller at 32 bytes, so this number should never exceed 32. This is unlike SPI and is something to be wary of! OK, so how do we use this in code? OK, now it's set up, how on earth do we use the thing? // Remember, this next line actually sends 0x00 0x00 0x00 0x9F! // Now, if our address is 0x123456, we are going to have to switch that around to 0x563412 because the PIC32 is a little-endian device. Yay. // The actual order of bytes *sent* will be 0x38, address[16:23], address[8:15], address[0:7]. // I've done it in a bit of a round-about way to hopefully make it clearer. // NOTE: HERE I DO NOT SET THE CHIP SELECT LINE HIGH. That would indicate to the PSRAM chip that the transaction was over! Phew, and now we've written data to the PSRAM. In the example code below I've included code for reading and writing in both single and quad-lane mode. Here's the code. Good luck! The files / images I'm sharing today are for my own personal development board, based on the PIC32MZ2048EFH144-I/PL. Do not use this board in any project that requires super precision or in life saving equipment type of projects. I cannot and will not be responsible if you make this and somehow manage to burn your house / neighbourhood / country down. I'm uploading them in the hopes that someone starting out can learn how to make their own PIC32MZ development board, hopefully better than my own. When I first started with the PIC32, the dev board options weren't awesome. I was looking using the PIC32MX in a DIP package, so it could be bread-boarded. I found myself wanting a more permanent solution and decided to look into what development boards there were available. 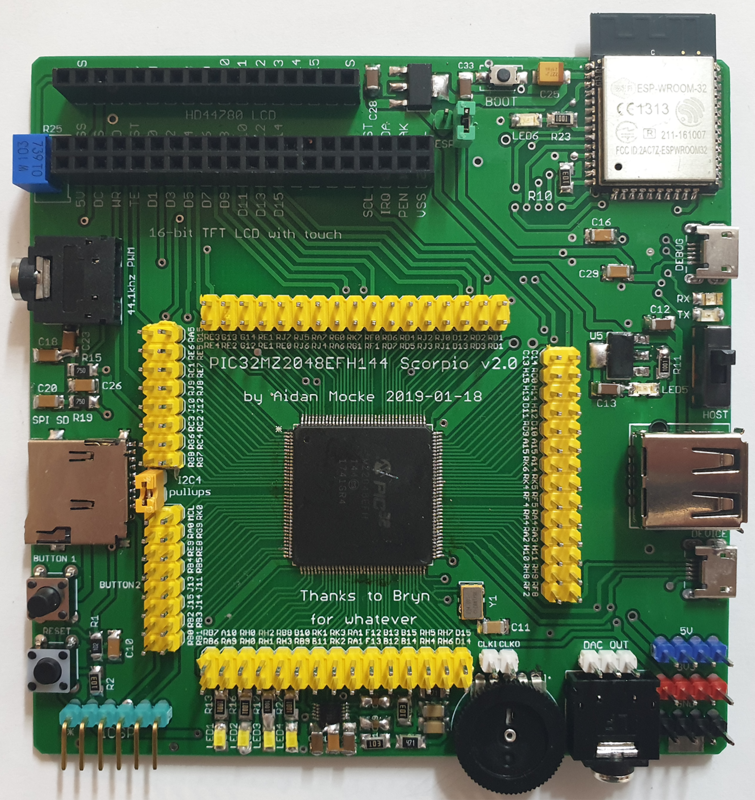 Microchip and other companies' dev boards are fine and all, some of them aren't even too expensive. 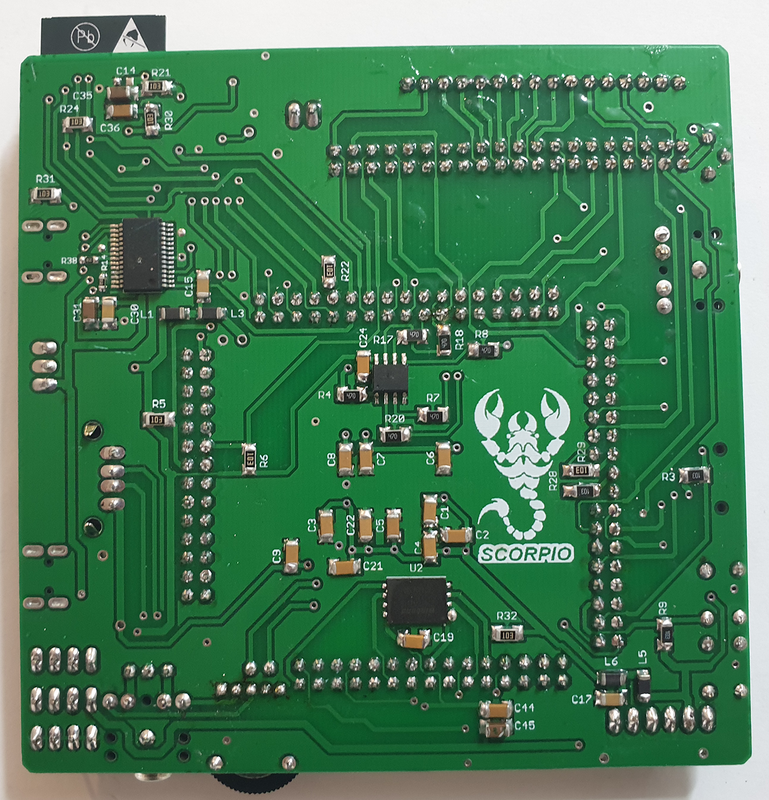 However, they're often either designed with a very specific purpose in mind or designed to attach to other dev boards of theirs and the cost very quickly gets out of control. I just wanted something I could plug Dupont cables into and I couldn't find what I was looking for, so I decided to make my own. I pretty soon got into making my own PCBs at home using a laser printer, iron-on paper, an iron and some etchant. For years I made my own boards and they were fine. When it came to the PIC32MZ I was able to make my own PCB for the 144-pin version but I quickly began to realise the limitiations of making single-sided PCBs. You can make double-sided PCBs at home but you have to be very careful to line up both sides correctly, drill the vias, solder the via pins in, etc and it turns into a lot of work very quickly. I also got tired of breathing in fiber glass when drilling all the holes for the headers. It may not seem like a lot but 200 holes done repeatedly gets a bit much. The etchant had already eaten holes in a good few pairs of pants too and I finally decided enough was enough and started looking online. I first used Seeedstudio's excellent Fusion PCB service and found the quality to be great. I also appreciate that the different PCB colours don't cost any extra money. An alternative to them is JLCPCB. Their service is slightly cheaper and has faster and more reliable turn-around times but you have to pay extra for any PCB colour except green. A huge advantage with JLCPCB is that you can order components at their sister site LCSC and use combined shipping to save on those painful DHL shipping costs, which for me come to about $16. While Seeedstudio and JLCPCB's prices are both good, you can get really cheap prices if you fit the board into 100mm x 100mm, double-layer. So my dev boards represent an effort to cram as much stuff as I can into that size limit while still having a working board. As such, there are too many vias, fast signals tracks are too long and routed through vias as they shouldn't be and the power and ground planes are probably more of a mess than they need be, despite multiple efforts to clean them up. Now, that out the way, my boards work fine. The USB is as fast as it should be, the ESP32 works, the SD card can be read at a very decent speed, everything works. If you can get over the worry of having an engineer looking at your board in disgust, then you too can make your own PIC32MZ dev board. So why? Well, this is my hobby, I enjoy it. I use my dev boards to get modules, motors, LCDs and all sorts of things to work before designing specific boards for separate projects. It's a kitchen sink. A very clogged up kitchen sink. And today I'm going to share all the files for it with the Internet. If anyone even reads this, I'm sure they'll leave some delightful comments but eh, I'm uploading them all the same. Yes, the erroneous "BUTTON 2" text has been removed in the uploaded Gerber files. Yes, the scorpion motif was cheesy as heck and has been removed (also, it was downloaded from a royalty free clipart site I can no longer find the link for). So basically, a lot of stuff, some of which is a hassle to solder by hand and none of which is necessary except for the USB port which provides power to the PIC32 chip. If you don't even want that, you could also power it directly via the ICSP connector using a PICKit or other programmer but bear in mind that needs to be 3.3V. The ESP32 has been added very recently and in rather a slap-dash fashion. It is supplied by it's own 3.3V regulator and can be entirely disabled by removing the jumper near it labelled "ESP32". I have tried to use 1206 sized SMD components to make it easier to hand solder but there are one or two places where I ran out of space (/willpower) and so used 0603. I have put together a list of components for use when soldering and a Bill of Materials with links showing where to buy the components. Here are the Gerber files for this project. Fixed bugs relating to SPI buffers overflowing, causing the program to stop working at different BRG settings. No longer need to set SCK as an input. Now works properly at multiple values of SPIBRG, so you can run at whatever SPI, CPU or System frequency you like. Configuration settings have been moved to mmcpic32.h and diskio.h and diskio.c have been removed. You need to #include "mmcpic32.h" in your main program now. Configuration made possible by changing a few lines of code in mmcpic32.h. Thanks again to Bryn Thomas and Ivo Colleoni for their help with this. Added a callback function that will be called, if set, multiple times during an SPI DMA read. I've tried to make it easy to see. The settings currently there are for my board, with the SD card's Chip Select on port H12 and the MOSI / SDO pin on RB5. Please change these to be correct for your board or nothing will work. Right under that is the only other setting you may have to change, the SPI channel number. Change this to whatever your SPI channel SD card is connected to. The rest of the settings can be left as is or changed as desired. The allowed ranges are shown in the comments for each line. The callback function will be called multiple times during a call to f_read(). It can be used for things like checking keys, starting other transfers, updating LCDs, whatever you want really. Do note that if you take too long in the callback function the DMA transfer's performance will either suffer or, in extreme cases, stop working (hasn't happened yet but who knows). So it is recommended you do something fairly short during the callback function. stage refers to the stage of the DMA read it is in, which can be DMA_STAGE_WAIT_TOKEN (waiting for the 0xFE token) or DMA_STAGE_WAIT_READ (reading 512-byte sector). args can be one of two things. In DMA_STAGE_WAIT_TOKEN it is how many bytes were read before 0xFE was found. In DMA_STAGE_WAIT_READ it is how many bytes were read (always 512 in this program). You can change this callback function to whatever you like, I've just given an example of how it could be used. In this program, the DMA read starts on line 3, waiting for 0xFE. At this stage, we have been sending 0xFF until 0xFE was returned. The DMA Transfer channel is now aborted when a Pattern Match for 0xFE is found on channel 0, resulting in less data being left in the SPI buffer. I have added code to handle bytes left in the SPI buffer and I strongly suggest you do not remove this code, even if it seems that no bytes are remaining. At lower settings for SPIBRG there can sometimes be one or two bytes left over each time and that can quickly lead to an SPI buffer overflow if not handled correctly. Please note: The standard for SPI mode on SD cards specifies up to 25MHz for transfers. I am using 50MHz and it works fine. However, if you want to use this code in something that requires reliability, please set your SPIBRG to 1 to halve the speed to 25MHz! As always, here's the code. If there are any issues with it, please do let me know. Why read from SD card in DMA mode at all? Warning: This post is going to be long because it's a complex topic and I've included lots of code in it. Turns out the "next time" from last post was today, the same day. An entire day spent on writing about DMA and airing my ignorance online. Yay! For the last several weeks / months / eternities I've been working on getting the DMA module to work with the SPI peripheral so that I can read from the SD card using DMA. My initial motivation for doing this was that when I had a few (i.e. too many) ISRs in my main code the SPI module would sometimes seem to get confused at all these interruptions and just stop working, crashing my program. However, DMA has also resulted in a nice large speed boost to SD reading, which is very useful. I've been working on this for ages in my spare time and I still don't understand all of it but today I'm going to go over my code and my findings. It works in my MP3 player and in large block transfers but I can't get over the feeling of mistrust I have for it so YMMV. This means that DMA Channel 0's start IRQ (SIRQ) will be SPI Channel 2's Receive Done IRQ (_SPI2_RX_VECTOR) and the source of DMA Channel 1's SIRQ will be SPI Channel 2's Transfer Done IRQ (_SPI2_TX_VECTOR). The _SPI2_RX_VECTOR is triggered whenever the SPI2 channel has finished receiving a byte of data, and the _SPI2_TX_VECTOR triggers whenever the SPI2 channel has finished sending a byte of data. This additionally means that the source address for DMA Channel 0 is the SPI Buffer SPI2BUF, because we are reading from that and the destination address of DMA Channel 1 is SPI2BUF because we are sending to it. We are going to send 1 byte at a time (so cell size is 1), because we are using SPI in 8-bit mode. Perhaps we could get even more speed gains in 32-bit mode but we're fast enough for the moment. We want to generate an interrupt when the transfer is done and I've chosen to use Interrupt Priority 4, Sub-priority 1. Finally, I've chosen to abort DMA transfers whenever there's an error on SPI channel 2. When that's done, the SD card has already internally queued up the first byte of data to send to me, it just has no way of sending it to me. The next time I sent it an 0xFF, it will send me that queued up reply at the same time as I send it the 0xFF. What this means for my DMA approach is that when I send it 0xFF, the reply it sends me will be an answer to the previous 0xFF instruction. And then, because I've sent it 0xFF again it will have another byte of data prepared for me and will be waiting to send it. It will only be able to send me that data when I send it another 0xFF. Secondly, looking at my fantastic picture of DMA data flow right above this, it becomes clear that we are going to make use of the SPI 2 Buffer. This means Enhanced Buffer Mode must be enabled for this to work at all. OK, theory out of the way, for now. You may be wondering why the Destination Size for channels 0 and 1 are set to 1. They can be set to the size of the actual transfer but the DMA module will see which one is bigger and use that anyway, so we can save having to repeat those two lines of code by doing it this way. As you'll see later, there's plenty more code to come. // How many bytes do we need to read each time? OK, I realise that's pretty long so let's break it up into sections. The one trick I used here, which I got from some microchip forum ages ago, is that as we need to output a constant 0xFF value, and this equates to 0b11111111 in binary, we can just disable the SDO pin of the SPI peripheral (by setting DISSDO to 1) and set the value of the port pin to 1 and it'll just output 1's. Pretty neat trick. As always, before we configure anything, turn if off. In this case, clearing the CHEN bit of DCH0CON and DCH1CON does this fine. We do not want to disable the entire DMA module while we do this because we have no idea what the other 6 channels are doing. The code is as discussed in my previous post, even the pattern matching which is looking for the 8-bit character 'þ' (0xFE). As we have previously set up most of the registers, we don't need to keep setting them up again. I routinely clear all the interrupt enables and flags in both DCH0INT and DCH1INT to avoid any potential problems they may cause. I am using the Channel Block Transfer Complete (CHBC) interrupt to tell me when the transfer is finished. The DMA_BUSY flag is my own internal flag that I wait for, to avoid hammering the DMA module's status bits and thus slowing down the transfer. Once the 0xFE token is found, or MAX_TOKEN_WAIT_BYTES is exceeded, we will get to the next stage of the state machine. This code is almost exactly the same as SPI_DMA_wait_token(). The only difference is that it disables pattern matching. They could easily be combined into one function, I've chosen to separate them for clarity as this is already a long and complicated subject. Once the transfer is done, DMA_BUSY is again cleared and we move on to the next stage of the state machine, reading the 2-byte CRC. Nothing much to say here. The CRC is 2 bytes of data and it must be read before either finishing the transfer or waiting for the 0xFE token again. Note: This could easily be combined into the last SPI_DMA_read() before reading CRC, but I've chosen not to do this for clarity. OK, we got the CRC. Do we have any more sectors left to read? If so, restart the wait for the 0xFE token again. In multi block reads, the first wait for the 0xFE token can requires hundreds or even thousands of 0xFF bytes to be sent while the SD card gets ready but subsequent waits for 0xFE usually require only a few to be sent. This is part of the reason multi block reads are much faster than single block ones. As I've mentioned multiple times before, this code isn't perfect and it's still under development. It seems to be working so far but I wouldn't trust it in anything you truly care about. Again, the SD card SPI specification allows for a maximum of 25MHz, and my code is running at 50MHz so if you experience issues, that's the first place I'd look (set SPIBRG to 1 to get 25MHz).